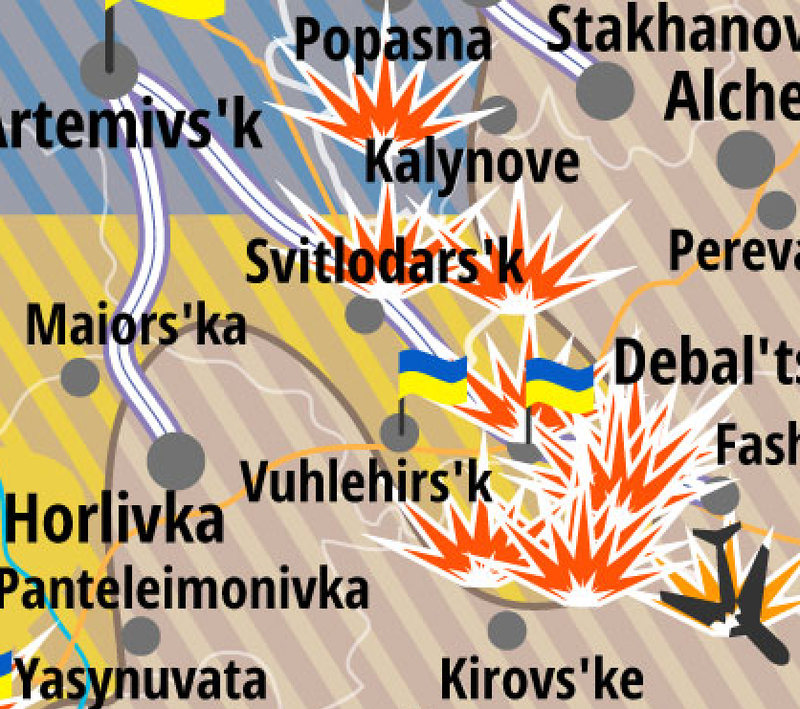 Is the fall of Debaltseve imminent? – A threat assessment. 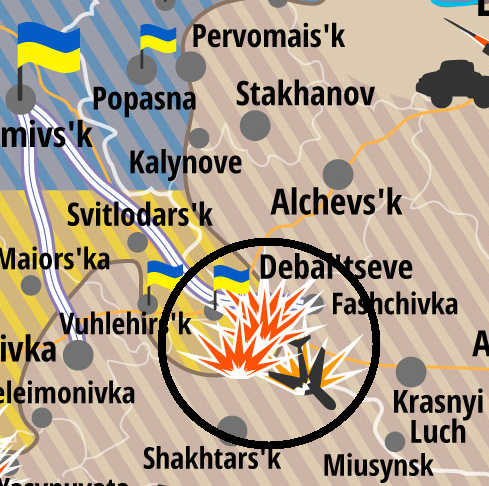 On January 9, I predicted an imminent offensive in and around the Ukrainian city of Debaltseve, calling it “Operation Closing the Gap” as that last remaining Ukrainian stronghold in eastern Donetsk region does not only look like a cut into the Russian-held territory in Donbas, it also feels like one for Moscow and its puppet regimes in eastern Ukraine (see map below). 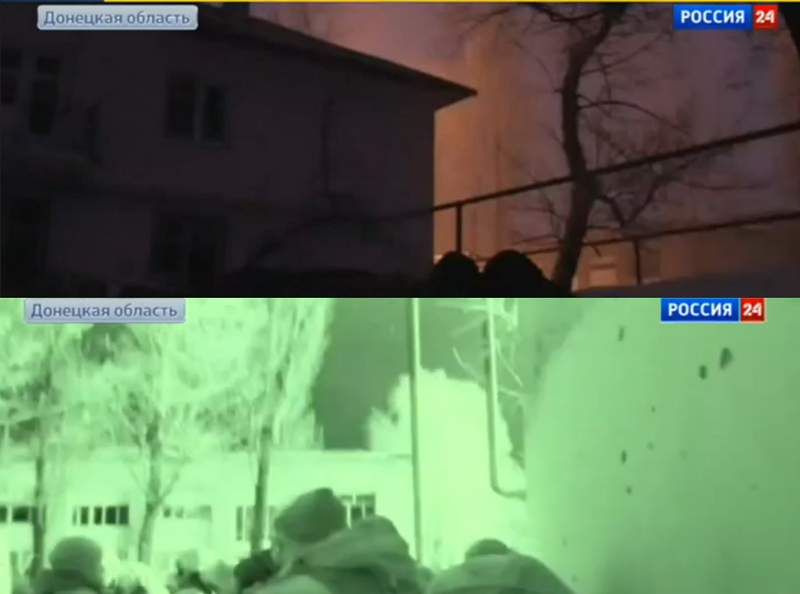 Just a couple of days later, the “much-anticipated” offensive began after Russian army troops took over the strategically important cities of Horlivka, Stakhanov and Alchevsk (1, 2), formerly held by semi-professional Russian invasion forces. 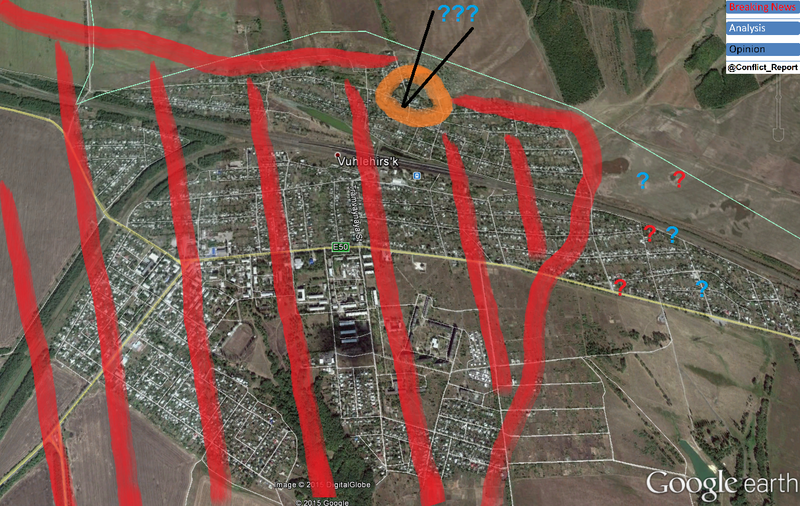 Since then not only Russian media speculates about an imminent fall of the city possibly preceded by creating a pocket in which thousands of Ukrainian soldier might be caught (oftenly going by the nam “Ilovaisk 2.0 bringing into mind the encirclement of the southern Donetsk city which led to the death and capture of around 1000 Ukrainian troops). But how big is the threat really? Is the “imminent fall” of the city just ahead? To answer these questions, a look at the current setting on the ground is an absolute imperative. However, it appears that this setting and the military developments leading to it and continuing these days are rather a question of perspective than written in stone. So how can the qestion be answered according to the involved actors onthe ground? 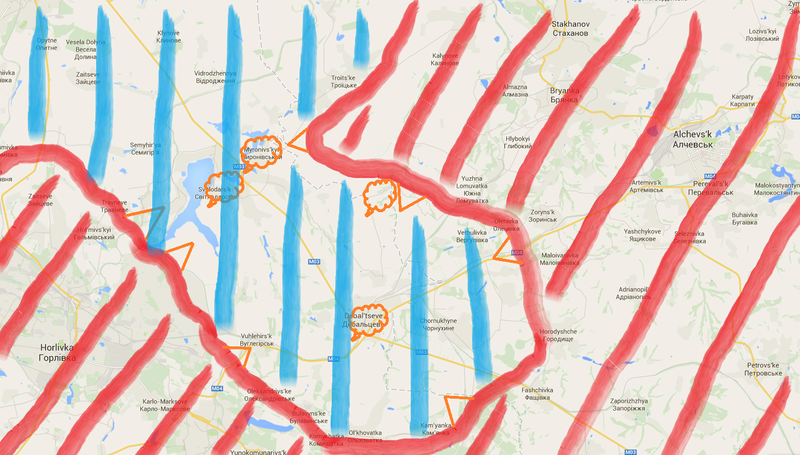 Yes, if you look at the pro-Russian map of the situation and follow its creators’ (and media) reasoning. In there portrayal of the situation, the southern line of defense along the villages of Mius, Nikishyne to Bulavyns’ke has been overrun by Russian forces, the push from Zoryns’k in the north east already rached the outskirts of Debaltseve itself and the pocket in the west as almost closed with Svitlodars’k and Myronivs’kyi reached, leaving a less than 2 km broad corridor to supply Debaltseve being closed within hours or days (see map below). 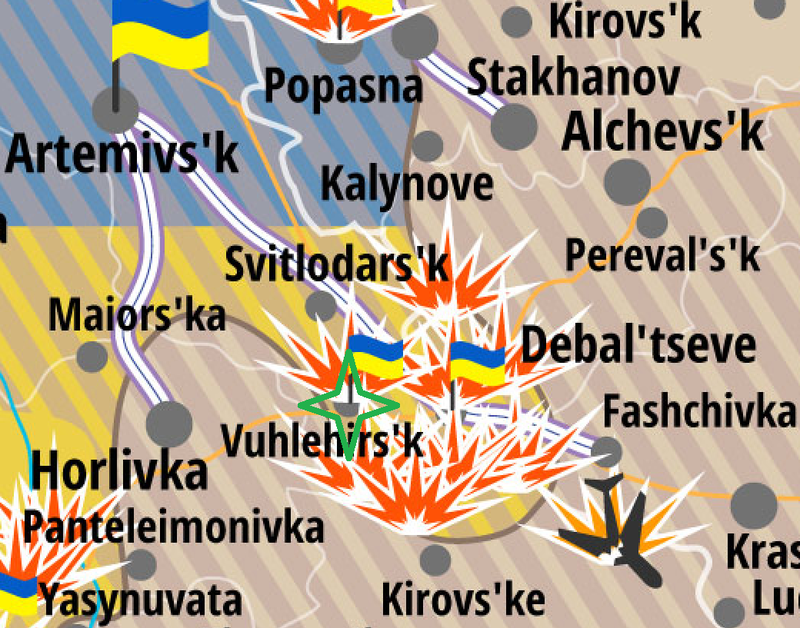 No, if you look at the official Ukrainian army map and follow its reasoning of the current military situation. Despite multiple indicated battles and artillery shelling in this battlefield sector, there are no territorial changes – since September 2014 (!). The southern frontline extends just north of Kirovs’ke, the north-eastern one is close to Zorins’k and in the west, Svitlodars’k and Myronivs’kyi are not even close to being reached, leaving an almost 10 km wide corridor to Artemivs’k and indicating nothing like a pocket in the naking (see map below). Comparing the map to the Ukrainian one used at the beginning of the article (from early January), it even seems like the distance between Svitlodars’k and the Russian-occupied territory has almost doubled since then putting it in an even safer position. Looking at these two assessments of the current situation by the opposing parties, it becomes obvious that both include partial exaggeration and respective whitewashing of the real situation on the ground. So how does it really look like and what is the prospect for the next days? The answer is hard to find as there is a particular lack of footage and verifiable from this very front sector. However this alone also already reveals something about the real situation. Over the last months and especially since January 2015, Russian media representatives became more and more a propaganda mouthpiece of the advancing invasion forces – mostly Russian regular army units forwardmost by now. 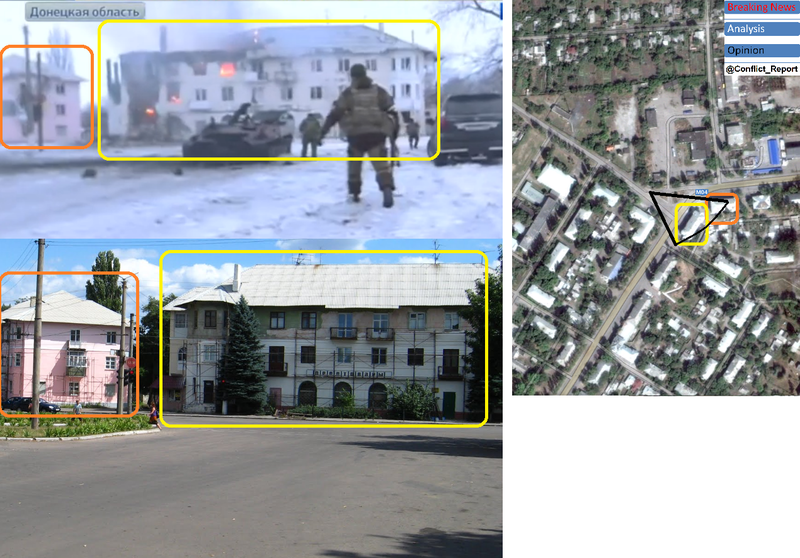 Hence, footage of every possible advantage, even though achieved by obvious Russian army troops, is recorded and broafcasted like in the cases of Checkpoint 31 in Luhansk and Verkhn’otorets’ke in Donetsk region. 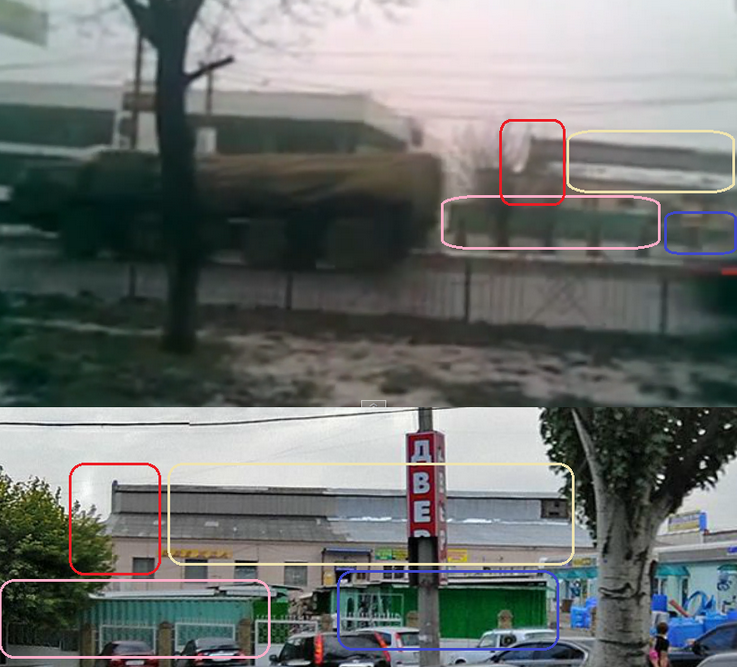 Therefore, there seems to be a quite linear connection between the apprearance of footage from the respective front and military achievements in the area in question: No footage = No advantage. As there is not Russian media footage of storming and holding Nikishyne or observing the M03 between Debaltseve and Alchevs’k so far, it can be concluded that these positions were not really taken or only in sight so far and remain under Ukrainian army control. At the same time it is out of question that Russian troops heavily shell Ukrainian positions around Debaltseve and along its only supply line since almost two and started several tank assaults on it, without going “all in” and verifiable having lost significant numbers of T-64, T-72 or even T-80 so far. 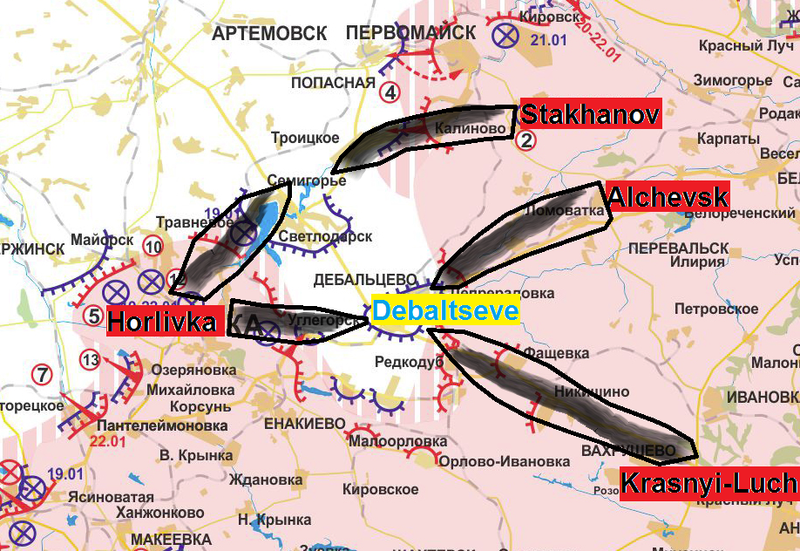 According to different reports by the “Information Resistance” analysis center and the Ukrainian government, the Russian army command has amassed some 2000 troops just north of Debaltseve (mainly Alchevsk, Stakhanov, Pervomaisk) and another 2000 to its south-west (in and around Horlivka). These troops are in possession of hundreds of artillery pieces, multi-launch rocket systems and tanks of various kinds. Also therefore, this sustained and increasingly heavy fire must take its toll on Ukrainian troops from a very basic / physical point of view and is leading to increasing casualties and loss of material along the front. Numbers are sketchy, but it can be assumed that between 10 and 20 Ukrainian troops drop out of the defense of Debaltseve per day, getting killed or injured by all kind of Russian attacks (that estimated figure – some 30% of the daily Ukrainian casualties – is generaly confirmed, but only seldomly geographically located and thus not 100% certain). These troops and their damaged / destroyed equipment must be replaced it must be questioned if the Ukrainian army is able to do so for the weeks and months to come. The following (self-created) map shows the situation as it is most likely right now on the ground, considering Ukrainian as well as Russian reports with a grain of salt. Marked are areas held by the Ukrainian and Russian army / attackers as well as verified attack direction and shelling targets over the last 24 hours. As the Ukrainian side is running low on resupplies in manpower and equipment and the Russian side seems to have an endless flow of new arms, professional soldiers and sacrificable fighters (among them confirmed Russian criminals from Tyumen and Rostov, being forced to fight in Ukraine to avoid their respective prison terms in Russia), there seem to be no sustainable realistic outlook of holding the Ukrainian front as it is. It remains dubious if the Russian side has already started to use its elite army forces from the 58th army of the Southern Military District, which are also confirmed to be active some 20 km north of Debaltseve. The only mention-worthy tank assault so far happened on January 25, coming from the Luhansk village of Kalynove and being stopped at the outer northern line of Ukrainian defense in Sanzharivka. If the Russian force finally decides to seriously use its main force in Luhansk, there seems no reasonable chance, the Ukrainian army will be able to hold back such assault for a very long time. This assault – in my analysis – has not started so far, but the threat of it beginning soon clearly stands in the room. 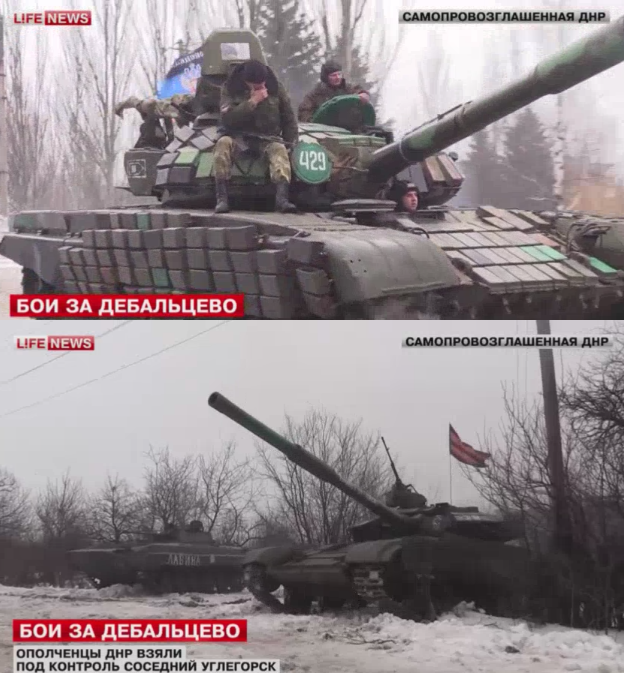 In conclusion, the fall of Debaltseve seems not imminent talking about a span of hours or days. Too many Ukrainian forces are defending a too large area to be simply encircled like it happened in Ilovaisk in late August last year. 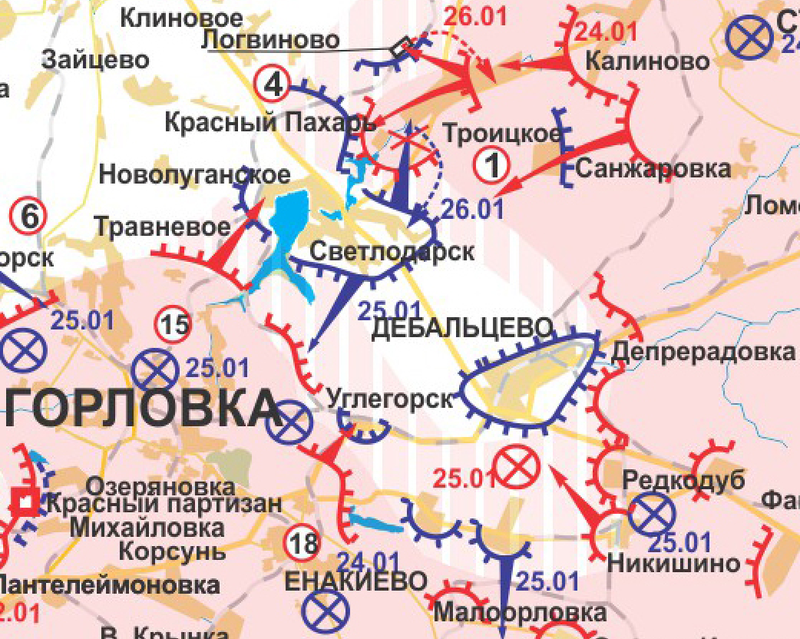 Also even if the pocket is closed in the west and the M03 is cut off near Svitlodars’k, there is a high chance that Ukraina would finally decide to go all in and attack the newly Russian-held areas to save several thousand soldiers in and around Debaltseve. This however would not change the general setting at the front and only delay the siege by some days or weeks. At the same time, the fall of Debaltseve is inevitable intermediate-term, talking about the coming weeks and months if there is no radical change in tactics by the Ukrainian side or a – very unlikely – real ceasefire starting soon. They Ukrainian strategy of “holding the line” didn’t work around Donetsk airport, it didn’t work between Avdeevka and Horlivka and it didn’t work between Frunze and Krymske, all areas where Russian forces took control over the last 10 days only. Purely defensive operations against an enemy with the fire – and man – power observed in eastern Ukraine during the last 4 weeks, leads to sustained territorial losses with only the needed time depending on the inadequacy of forces and equipment at the respective front sector. 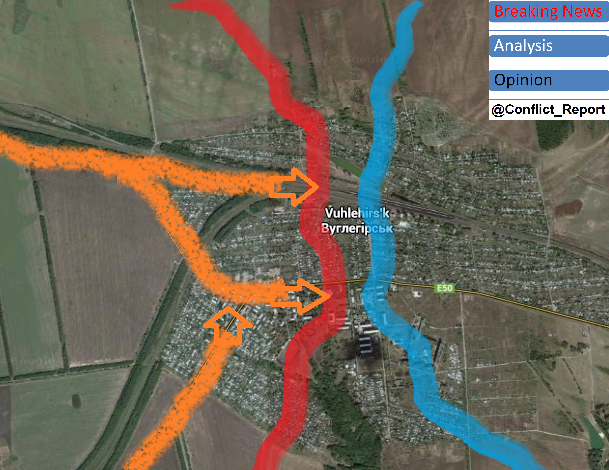 The Russian strategy around Debaltseve is clear and openly admitted (see illustrative map below). Without giving a crushing – offensive – response interfering with these plans and thereby forcing the aggressor into meaningful negotiations on longtime mutually respected demarcation lines, the threat of the fall of Debaltseve is as high as never before. Not within days or possibly weeks; but almost certainly at some point during the first half of 2015.